Hm. Not sure if I’m liking this new Blogger setup yet. Why change something that works? To make it better, I suppose. 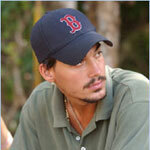 Behold the majesty of Boston Rob, who did NOT win Survivor tonight. But I voted for him to win the second Million Dollar Prize. He proposed to Amber, though, so my inner 16 year old girl just squealed with delight! Absolutely squealed. For Mother’s Day, we took Mom to the Borgata. And we all won! I got four deuces in video poker and won $350. 🙂 Which comes in quite handy for this move. Speaking of, let it happen, for the love of Pete. I’m packed as much as I can. I think. I’ve been playing City of Heroes lately. I’m on the Guardian Server, and you can see my hero, “The Apprentice” below. Go to CBS.com and vote for Boston Rob (Rob MARIANO) to win a million dollars! And check out the new and improved Freezerburn section! Now powered by PHP and MySQL!